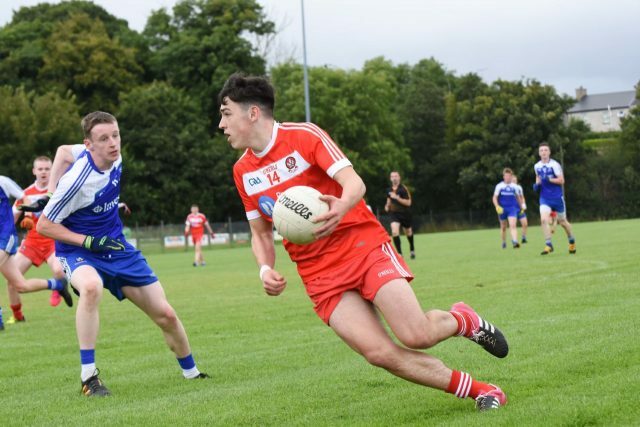 The finals of the U-16 Inter-County Buncrana Cup took place in Donegal on Saturday August 13th. Noamh Padraig Muff and Burt GAC hosted the two semi-finals while the finals were played in Buncrana GAC. Derry defeated Armagh on a scoreline of 3-14 to 2-07 in a game which Armagh led for long stages but Derry, assisted by a couple of goals, finished strongly to claim victory. Meanwhile Monaghan had a one point victory over Donegal on a scoreline of 1-10 to 1-09 in a close and exciting game which could have went either way right up to the final whistle. Donegal edged out Armagh in the 3rd/4th placed game by 2-09 to 1-07. In the final Derry and Monaghan served up what supporters felt was the best game of under-age football witnessed in a long time. Played in the right spirit with lots of determination and heart this game flowed from end to end with a fantastic display of skills. Tackling, blocking, catching, kicking and scoring were to be seen in abundance with the supporters treated to a great game. At the end of normal time it was a draw on a scoreline of 6-08 to 6-08 with the Derry goalkeeper pulling off a spectacular save from a penalty in the dying moments. Extra time preceded but both teams could not be separated and it finished 6-11 to 6-11. A special thanks to the three clubs who hosted the games and provided facilities in excellent condition. Also thanks to the two referees Joe Corcoran and Kieran Eannetta who expertly handled the games. Replay date to be confirmed. View more photos from the Buncrana Cup Final over on the Ulster GAA Facebook page.